My blogging friend and podcasting cohort, Anne (aka apricotsushi), recently mentioned on Twitter that her husband challenged her to pick one game from her backlog each month this year and play it through to completion. Considering the depressing size of my own gaming backlog, I thought it might be wise of me to do something similar over the next 12 months. So, between now and the end of 2013 I'm going to choose one of my many woefully overlooked games and play it for an entire month. If I'm able to "beat" any or all of these games, great, but if not, that's OK, too. 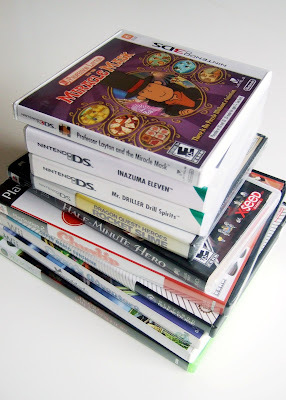 As of now, here are the games I'm considering tackling as I work my way through this so-called challenge: Chulip (PS2), Corpse Party (PSP), Deadly Premonition (Xbox 360), Dewy's Adventure (Wii), Dragon Quest Heroes: Rocket Slime (DS), Half-Minute Hero (PSP), Inazuma Eleven (DS), Mr. Driller: Drill Spirits (DS), Professor Layton and the Miracle Mask (3DS), Romancing SaGa (PS2), Super Mario Sunshine (GameCube) and, finally, Xenoblade Chronicles (Wii). Full disclosure: as some of you are likely aware, I've already started a few of these games (namely, Corpse Party, Deadly Premonition, Dewy's Adventure and Xenoblade Chronicles). None of them were played for more than a few hours, though, so I think it's OK to include them here. I'm not yet sure how I'll update all of you in regards to my progress, by the way. Maybe I should try to publish weekly blog posts (titled something like, "Bye-Bye Backlog Diary Entry #1: Chulip") to keep myself in check? Btw, did you ever play Ghost Trick on the DS? As for Sunshine staying on my list: I think you can rest assured it will. I can't believe I've waited so long to play it, really. I'm guessing you're a fan of it? I'm glad to hear you're going to finish Epic Yarn, one of my most favorite Wii games, no question. I look forward to hearing about the other games you decide to play as part of this challenge! How will I hear about them, though? Via Twitter? Oh, that's good to hear, miruki. I remember loving what I saw of La Pucelle back when I bought it (YEARS ago), but ever since I packed away my PS2 I haven't played any of that system's games. A shame, I know, but what can you do? Anyway, I'm looking forward to experiencing this painful dub you mentioned here. Is there an option to turn off the voices? I hope so! I'll go check out your recent blog post in a second, by the way. Thanks for letting me know about it! I haven't played Ghost Trick yet, by the way. I'm still interested in it but, well, I just have too many other games I want to buy and play at the moment. Maybe someday! I'm really excited for you to play Rocket Slime! One of my top-5 DS games of all time- it's funny, fun, and beautiful. I love it so much! I should try this challenge. I need to dive back into Corpse Party, Tactics Ogre: Let Us Cling Together, Gravity Rush, and Valkyria Chronicles II, but XCOM and Persona 4 Golden have been eating up a lot of my time while I wait for Fire Emblem and Sly Cooper 4. I like hearing that Ghost Trick is just a 10-hour game, miruki. Like you, I rarely have the time these days to devote 40, 50, 60 hours to a game. I remember seeing Anne tweet about that! You're a braver man than I for giving Chulip a go, but really, it is quite cute/odd. Just know that if you get feeling really "stuck" then that's actually how the game is and so you shouldn't feel bad about seeking assistance. Oh, i hear ya, Kimimi. I'm a bit ... nervous, to be honest. I'm going to give it my best, though, and really try to force myself to devote some attention to these games. BTW, I'm already thinking that if I'm successful with it (as in, if I actually spend a good part of each month playing a single game from my backlog), I may do the same thing next year -- although next year's version likely would focus on retro games (Famicom and PC Engine games, especially). Anyway, should you ever do something similar, you know I'd love following your progress! Thanks, Ryan! I really can't believe I've yet to play it. I loooooooove the DQ slime character, and I've heard so many good things about this game, but I've just never gotten around to playing it for one reason or another. All of that hemming and hawing ends this year! You should try it, Zaphod65! Really, all you have to do is try. If it ends up not working, no biggie! That's the attitude I'm taking with it, anyway. Thanks for letting me know I should turn to a FAQ, etc., if I get stuck. I'm definitely not against such things (usually), so I'll remember that if/when I get stuck in this game. As for adding Disqus to your blog: It's as easy as pie! I originally was turned onto it by Anne, by the way, and even followed her advice to get it up and running on my blog, but now I can't find which blog post of hers tipped me off to it. Anyway, I remember the Disqus site doing a great job of explaining how to get it up and running on a Blogger-based blog. I'd suggest you go check out the site -- and let me know if you have any questions whatsoever! I like VC2 a lot. The art style isn't as beautiful as the PS3 original, and the main character can be a little annoying at times, but it's a solid little portable game. I see why the school setting gives people fits -- it drags down into some really juvenile humor at times -- but the core gameplay is still fun. Not a bad idea. Man, I wish I had time to do this. OMG I am so addicted to Prof. Layton now! Nintendo gave me a free download-code for Prof. Layton and the Miracle Mask so I downloaded it and now I just can't stop playing it! I never played a Prof. Layton game before and I just looooove it. Thanks, Zaphod65. Still not sure I'll ever pick it up, but it's good to know the gameplay is up to snuff regardless. This is your first Layton game, Lizzi? Interesting! I played the first DS one to the end, but have played the second and third DS ones less and less. Still, I'm interested in this 3DS sequel. Hopefully I'll like it as much as you have so far! Really, Matt? That's great! I'm glad to hear that you'd love to hear updates/impressions, because I'm definitely planning to share them. With that said, I'm really going to have to start playing Chulip this weekend. Or maybe even tomorrow night? Oh man, I'd totally do this if I had the time. La Pucelle is my favorite NIS game -- I highly recommend putting it in your queue, and yeah you should play it in Japanese. Not sure if you can finish it in a month tho; it's huge! I would've finished Sunshine if I didn't get stuck, but it's so freaking hard. And Romancing Saga's been in my backlog forever -- I'd love to go back to it. Weekly status updates are a great idea to keep you honest. Well, just remember, Steve, that I'm not forcing myself to beat/complete any of these games. If I can do that, great, but if not, well, at least I finally played them! Ah that's right, I forgot. So I assume you're going to just keep playing when you have time for the whole month unless you get bored or stuck? And then if the month ends you will stop whether you have finished or not so that you have time for the next game? I've heard great things. It sounded like a cute game, but outside of one person I used to work with, I didn't know anyone really knew about it (though I can't say I'm surprised hearing about it in your blog, given the awesome and obscure games I've seen pop up here)! Yep, that's the current plan. I'm not planning to stop if I get bored, though. And if I get stuck, well, I'll turn to a FAQ or Twitter for help. It'll be interesting to see how it goes! Maybe my last post of the month will recap my progress on the game, share how long I played it, etc.? Also, thanks for the nice words about the blog. I appreciate them! Don't worry, Igor, I'll play Xenoblade. It won't be my first game, though. Maybe in a month or two or three? I fear it's only going to get bigger. Ah, consider me jealous, Espiga! Did you get a game or two (or more?) along with it? As for not having the time: to be honest, I'm not sure I'll have the time for it, either, but I'm going to try. Really, I just decided to do this to push myself to play a bunch of games I've been meaning to play for some time. It doesn't matter if I play them for 40 hours each or just 5-10. It came with the game on the screen in the picture, which is Hunter X Hunter: Greed Island. But I got a good deal on the system, it was from a US seller, and there was free shipping as well. I couldn't pass it up! I'm definitely looking forward to hearing about the games you end up playing. As someone with a particular affinity toward JRPGs, I'm excited to hear your thoughts on Xenoblade, Rocket Slime, and most especially, the Romancing SaGa remake. I often feel like I'm the only one in the world that actually finds some enjoyment out of the SaGa games, so it'll definitely be interesting to hear your take on it at some point, even if you don't get arond to it for a pretty long time. Oh, that does sound like a good deal, Espiga. And it looks like it's in great shape, too, which is even better news. As for me playing through Xenoblade, Romancing SaGa, etc. : yes, it will be both exciting and interesting, I think, especially since I no longer seem to have the attention span for such games that I used to have. I'm esp. interested in seeing what the Romancing SaGa remake is like, by the way. I've always loved the looks of and the idea behind the Super Famicom originals, although I've barely played them due to the language barrier. Haha, you've beaten me to the punch, Bryan! I better get my post out quick so we can compare notes and motivate each other as we go along. Looks like you've got a great list of games there! I was originally thinking of focusing on RPGs and not doing the 12 games a month thing (one RPG a month would be suicide), but now I'm preferring the idea of a game a month, as it'll do wonders for clearing out the backlog if I actually stick with it. I gotta admit, one of the reasons I haven't posted about my backlog project yet is because I can't come up with a cute name for it! You've beaten me again – "Bye-Bye Backlog"? That's a winner! I went with a game a month because I knew that if I went with any other system (such as, playing each game until they've been beaten) I'd have a harder time sticking with it. Of course, I may have a hard time sticking with this system, too, but I'm hoping I won't. As for coming up with a name for your project: I understand how hard that can be. I'm glad you like 'Bye-bye Backlog,' by the way. Sadly, I may not use it for all of my follow-up posts. Truthfully, I don't know what I'm going to call those yet. Ack! I agree about the art style used in the remake though. Those bobble-heads just look awful... Especially considering the absolutely incredible concept art that the SFC characters had. Have you seen any of it? Maybe I missed a previous acquisition post, but I was surprised to see the new Layton at the top of the pile. I seem to recall you saying on the podcast that your declining interest in Layton DS games made it an unlikely purchase. But. . . you buy a lot of games, by anyone's standards, so maybe I'm not so surprised. And I'm not one to talk; I just purchased Kirby: Mass Attack, and I've not completed Epic Yarn and haven't even removed the shrinkwrap from Return to Dreamland. Oh, yes, I know about the WonderSwan Color port of the original Romancing SaGa. Actually, I've been thinking of buying a copy of it for ages, despite the language barrier. Who knows, maybe I'll eventually learn enough Japanese to be able to play through it without getting completely lost? As for the PS2 remake: yeah, I don't know who decided that art style was a good idea :( Hopefully it's still enjoyable to play, though. Hey there, David! Well, I hate to admit this, but I don't always write up an acquisition post for every game I buy. Also, I probably passed over Miracle Mask because I didn't go out of my way to buy it; a copy of it came with the pink-and-white 3DS XL I bought before the holidays. I can't say I'm completely stoked about it, but I do want to play it. I have a feeling it'll be a make-orbreak experience for me, though--in other words, should I not love it, I likely won't get the last Layton game. I like hearing that you're not all that different from me, by the way. Hey, at least you can rest assured that those unopened/unfinished Kirby games are great. I can vouch for Epic Yarn and Return to Dreamland, especially, as I consider both to be among my favorite games of the Wii generation. I've always liked what I've played of Mass Attack, but I've only played a few hours of it so far, so I can't yet say if it lives up Epic Yarn or Return to Dreamland (or even Canvas Curse). Hopefully we'll both like it in the end, though! I'll Scratch Your Backlog If You Scratch Mine. omg those are great - I might just call it "Beat the Backlog: 2013 Edition"! I definitely think it's a good idea to do a few "check-in" posts over the course of the month, though, to keep yourself honest! I'm trying to think of ways to get lots of people involved so that can be almost like a support group for people with massive backlogs ;) that way everyone can chat about their progress in the comments! Alois here just suggested a few silly names that got me thinking... I quite like "beat the backlog"! I might go with that! That would be great! Would you put it on your old (regular) blog, or your tumblr? Also, I saw your tweet about the list of games you were planning to play. What I was wondering, though, was if you'd be updating us on your progress there (on twitter) or somewhere else. Anyway, keep me in the loop, OK? I definitely want to read your thoughts/impressions on those games. Ha ha, yes, I think a little support will be very helpful as we attempt to work through our backlogs, Anne! Yes, I think that one's good, too. Less silly than the other one (what can I say? I like silly), but still really good--and definitely more, er, descriptive, too. Um, yes? I don't know if he wants people to know it's his, though. Justin? Regardless, Steve, I can send you the URL via Twitter DM, OK? Good look with this dude, sometimes it doesn't always work out as its harder in practice than it seems. I started doing a similar thing last year as i wanted to start playing more of my retro games. So i started playing a 360 game or two, then a retro game or two and vice versa. I do think it'll help that I'm not trying/forcing myself to finish any of these games. I just want to play them consistently for a month, which is more than I'd likely do otherwise.